Here's how to beat Isshin Ashina near the end of Sekiro: Shadows Die Twice. Isshin Ashina is quite possibly one of the most intimidating and difficult boss fights in the whole of Shadows Die Twice. In our Sekiro Isshin Ashina guide, we'll be walking you through everything there is to know about this difficult boss, including how you can take Isshin down for good. We mentioned previously that you will fight Isshin Ashina as the final boss of Shadows Die Twice, but only if you picked certain options previously. 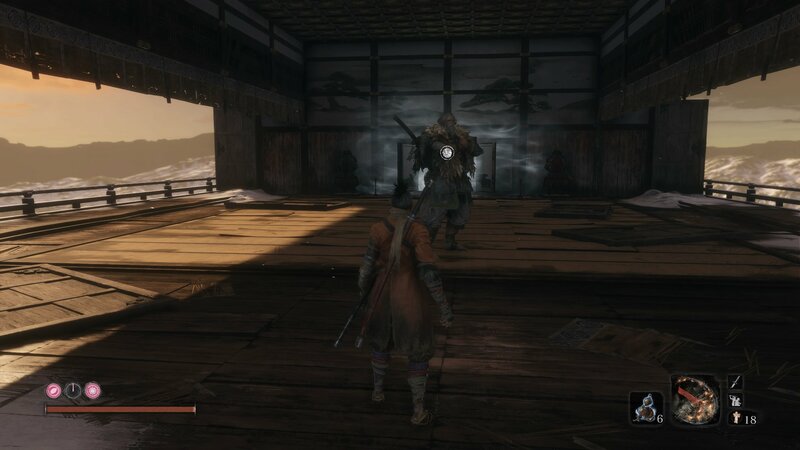 To get to the fight with Ashina, you must obey the Iron Code and abandon Kuro when asked by Owl at the top of Ashina Castle. From there, after you've defeated another boss that we won't name here for spoiler reasons, you'll face off against Isshin Ashina as the final fight of the game. Ashina might look the part of an old man, but he acts like anything but. His standard attacks with his sword typically come in pairs, sweeping around waist height on Wolf, so it is possible to jump over most of his standard attacks. You'll want to practice your deflections on Isshin Ashina's normal attacks, because if you can, deflecting attacks instead of dodging them will get this fight over with quickly. In this initial phase, Ashina acts like your average, but very quick, swordsman. He has three variations of the red kanji attack: one which dashes forward in a large sweep, covering roughly five meters, while the other one moves a similar distances in a thrusting attack. There's also the grab attack that the previous boss had, so when you see Ashina sheathe his sword, get ready to dodge step backwards. It's actually quite easy to cheese this first stage of the fight, with one key ability. If you've unlocked Shadowrush, which is at the end of the Shinobi Arts Skill Tree, you can use it repeatedly to cover ground and skewer Ashina while he's walking slowly towards you. When Isshin Ashina raises his sword over his head and holds it there momentarily, get ready to dodge. If you can dodge to the right when his sweeping attack comes in, and then dodge to the right again during the immediate follow up attack, you can score yourself a quick few hits on Ashina. The main attack to look out for is one where he sheathes his sword. If you're far enough away, Ashina will sheathe his sword, then dash towards you in one fluid motion, letting rip with two huge attacks. You want to avoid this at all costs, and if you can stand far enough away, you can quickly get in a few hits after the attacks have passed. For the second phase of the Isshin Ashina fight, things really heat up. Basically, the boss has an entire new set of attacks, nearly all of which can cause an area of effect fire attack to spring forth from his sword. The one major new attack starts with Ashina once again putting away his sword. You'll notice now that the patches of fire on the floor glow a hot orange. They then erupt in fiery explosions, and immediately afterwards, Ashina zooms in on you to execute a huge chain of attacks. We'd recommend standing still, and then repeatedly jumping to your right just as the fire erupts, so you take yourself out of range of the sword attacks. Another deadly attack is where Ashina holds his sword above his head again. This time when he brings his sword down a pool of fire will burst up from the ground a few feet in front of him, but there'll also be a horizontal slice attack following this, which sends a wave of fire shooting forward. You want to run and jump around to the right of these attacks, landing in two quick hits against the boss if you have time. The key to winning this second phase against Isshin Ashina is to always be on the move. You want to forget about deflecting attacks in this phase since they nearly always come with an explosion of fire, and instead try and jump over/run around the boss, landing in a quick few hits where you can, before retreating backwards again. Come the end of this fight, you'll have attained the 'Shura' ending of the Sekiro. Unfortunately, this is commonly known as the bad ending of Shadows Die Twice, as it depicts a Wolf that's chosen a much darker path away from Kuro.